I hesitate to post a recipe for chicken soup, as it seems so axiomatic. 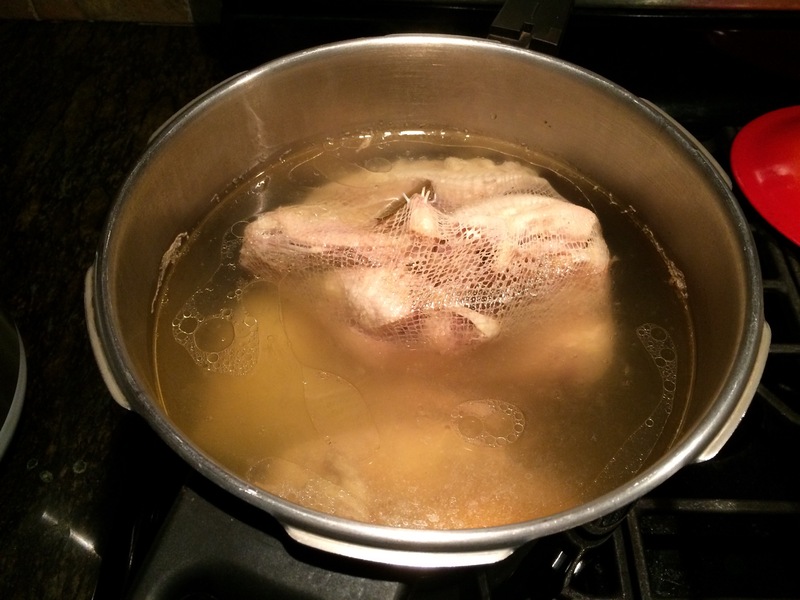 Who ever heard of a traditional Jewish cook who doesn’t make chicken soup? Throughout Jewish literature, chicken soup is extolled for its medicinal effects and often referred to as “Jewish penicillin.” However, I consider chicken soup to be a work of art. All cooks have their own particular techniques. I have made it various ways, but, this is my current method. Place the chicken, with hopefully the skin off in a food sock or if unavailable, a cheese cloth. Place the vegetables in another food sock and the potatoes in a third food sock. Add water and then bring to a boil and simmer until done. This can be made in a regular soup pot, a crock pot or a pressure cooker. In a crockpot, cook on high or low until done. This is not my preferred method, as it makes the soup too dark. Recently, I have begun making it in the pressure cooker at 7 minutes to pressure. When done, I adjust the seasoning, and pull out the various food socks. This way, does not require straining and is clear. I arrange all the cooked vegetables, potatoes and chicken in separate bowls, and serve according to everyone’s individual preferences. In the past, I used to also cut up new vegetables and then add them to the broth and serve. In general, there is very little flavor left from the first round of soup vegetables, so not everyone likes to eat them. I make chicken salad with the leftover chicken, assuming the chicken is also not too overcooked. I also serve it with rice, thin noodles or of course matzah balls. Adding fresh herbs like parsley or dill give it a beautiful fresh flavor. I made it for the holiday, so there are less pictures than usual. But, done is better than undone! It is similar to cheese cloth, but sewed up like a sock. Maybe I should post a picture of it? They are great time savers! Thanks for the info! Those do look handy. They are! Big time saver! Just bookmarked this page. I have been looking for a good chicken soup recipe for ages! Thank you! I am happy you dropped by too. Welcome! Yes. Very busy time of year. I suspect I will not be up fully for air until after they are over. Still, I always say, “I want the holidays to go through me, rather than me trying to get through the holidays.” Time is a spiral. I have been reading your powerful stories. Thank you for sharing them.